Niagara Presbyterian Church - Stained Glass Inc.
Stained glass scenes can be built with multiple panels side by side to add a truly incredible effect. Our collection holds many matching panels to make the addition of several stained glass pieces simple. Panels may be chosen with a similar pattern or a running theme, or they can be put together to form a landscape or one large picture. 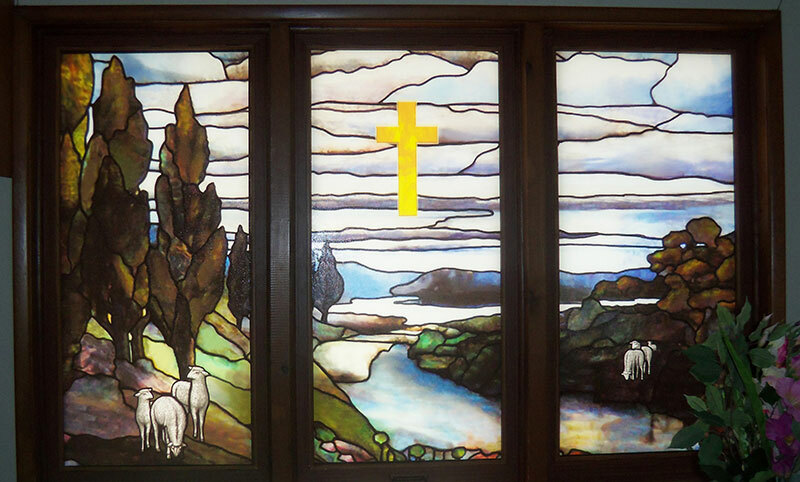 Gary E. from New York ordered three stained glass inserts for his church. The pastoral landscape, featuring a river running from a mountain lake, was part of our existing collection. One of our talented stained glass designers added the sheep and the cross to the panels at Gary's request. Sample drawings of the panels were sent to Gary and he approved them before they were sent to production. Gary said the congregation "thought they were just beautiful!" The three church stained glass panels fit beautifully alongside one another and form a perfectly lovely and serene scene. The addition of the symbolic lambs and cross made the panels even more perfect. It really came out beautiful and everyone was impressed with it. Thank you for all your help.